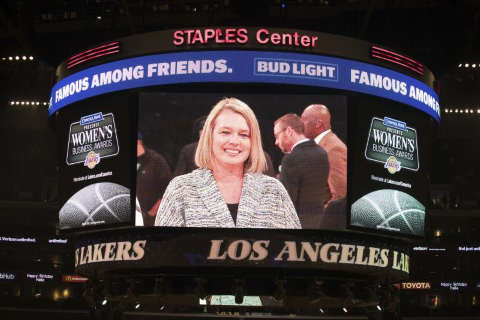 Jackson Tidus is proud to announce that Comerica Bank and the Los Angeles Lakers have honored Sonia Lister for her commitment to philanthropic and community causes. Sonia, a shareholder in the firm's Real Estate Services Group, has received the Comerica Bank Best of LA Women's Business Award as a Woman of Philanthropy for her many years of service to HomeAid Orange County. HomeAid is a non-profit organization whose mission is to end homelessness in Orange County through development, service and advocacy. Since 1989, HomeAid (founded by the Building Industry Association of Southern California's Orange County Chapter) has provided housing and services to homeless families and individuals in Orange County. HomeAid is the only community based organization that has successfully built/renovated 60 housing developments that provide emergency, transitional or permanent housing and support to Orange County's homeless. Sonia has dedicated herself to HomeAid as a board member and volunteer for the last 25 years. In 2008, Sonia was part of the group that received President Bush's Gold Volunteer Service Award in recognition of her outstanding service to HomeAid. Sonia was elected as the President of HomeAid from 2010-2012, the first and only woman to hold that position, and she currently serves on its Board of Directors. Sonia was instrumental in procuring the financing, purchase and development of the first emergency homeless shelter for families in Orange County owned by HomeAid, called the "Family CareCenter", which opened in the City of Orange in April 2017. This much-needed facility provides 56 beds and serves 10-15 very needy families per day. Sonia is also a volunteer organizer for HomeAid Essentials, which partners with the real estate industry to help collect donations of baby products and diapers for homeless mothers and their babies. In 2017, over 1,500,000 essential baby products and diapers were collected through this program. Sonia's longstanding devotion to charitable causes is truly inspirational and Jackson Tidus joins Comerica Bank and the Los Angeles Lakers in congratulating Sonia for her dedication to the community.